Click on the link above. Once redirected, search day-by-day from the drop-down menu at the top of the page. 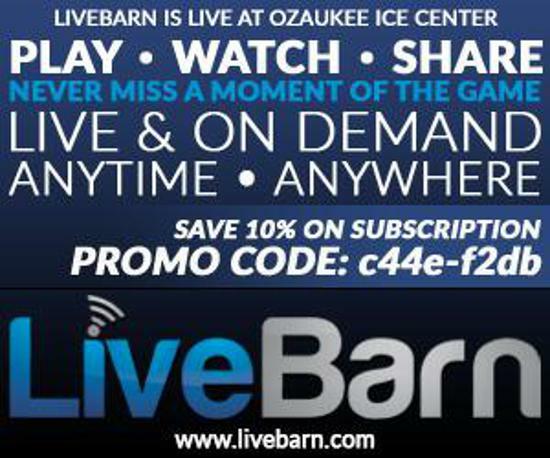 LiveBarn is Live at Ozaukee Ice Center. LiveBarn provides online broadcasts of hockey games at many rinks across the US & Canada. Games are broadcast both Live and via On Demand replay. Family & Friends can watch online when they cannot attend a game. Athletes and coaches can review their games and share video highlights online or download full games to archive. LiveBarn is available on a monthly subscription basis starting at $14.95/month. Use PROMO CODE: c44e-f2db for a 10% discount. While viewing On Demand, you can SHARE 30-second highlights via social media and email orDOWNLOAD 30-minute clips and store up to 30 hours of video per month. Click the Picture to be transferred to the Ozaukee Youth Hockey Association website.